Ruling PF Secretary General Davies Mwila has expressed anger and dismay at the action of the Lusaka City Council who have demolished and destroyed stalls at Luburma market commonly known as Kamwala Market. 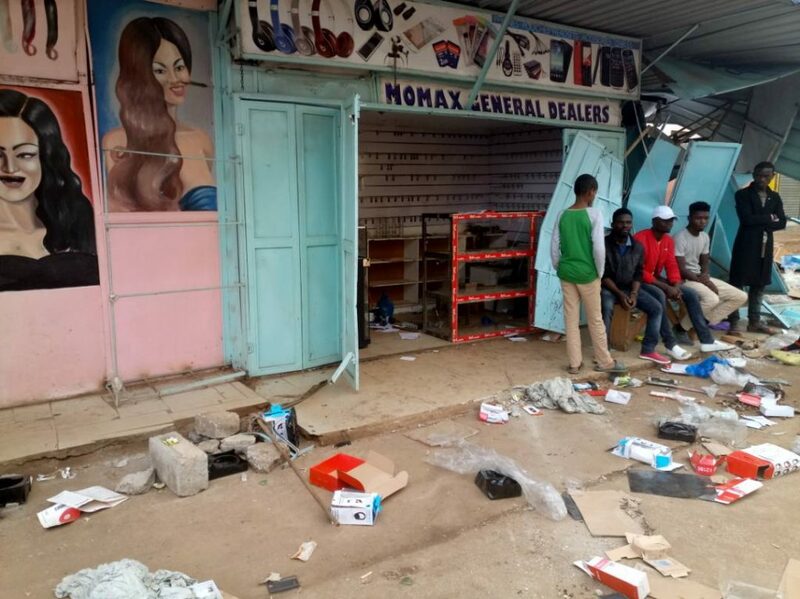 Over the weekend, several traders woke up to a rude shock to find their stores destroyed and their stock looted by Council police officers alleging that they are illegal stalls. But Mr Mwila has since summoned Acting Lusaka Mayor, Ms Chilando Chitangala to his office to explain why the Council had gone ahead to demolish the market structures without giving the traders prior notice so that they could remove their merchandise from the stalls before the Council could move in to erase the structures. Mr Mwila has said that the PF is angered and saddened by the action of the Council as it has jeopardized the very core of the traders’ survival and livelihood. Mr Mwila says that while as a Party, the PF does not support illegality, it is extremely wrong and insensitive for the Council to destroy and loot people’s property and he has since demanded that the Council compensate all the affected traders whose goods have been destroyed or looted. 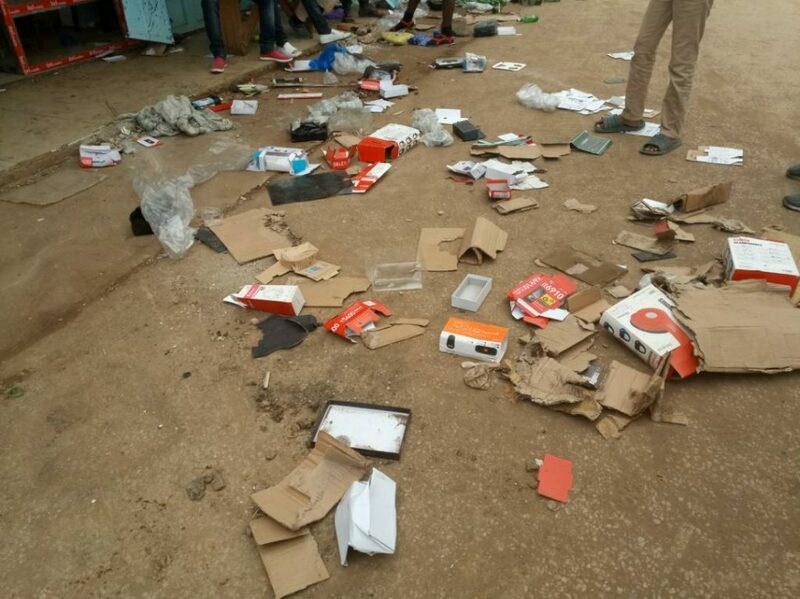 The PF Secretary General said it is heartless and in fact criminal for the local authority to destroy and loot people’s merchandise. He has demanded for the immediate investigation of what transpired and who was involved in the looting. Mr Mwila has asked for calm and restraint from the affected traders as the Party and Government look at corrective measures to help them. This is according to a statement issued by PF Deputy Director- Media Antonio Mwanza. One day we will wake up to a shocking realization that it is little children who all along have been at the helm of power. why are they destroying things and only in Lusaka? Where the president live? Look at that, looks like Syria. well said mr mwila thanks a billion, nothing wrong with authority giving warning. I thought the Ministry of Local Government should be dealing with such cases and not the SG of PF. The SG’s part is with managing the party and not the city. Where is the separation of power? 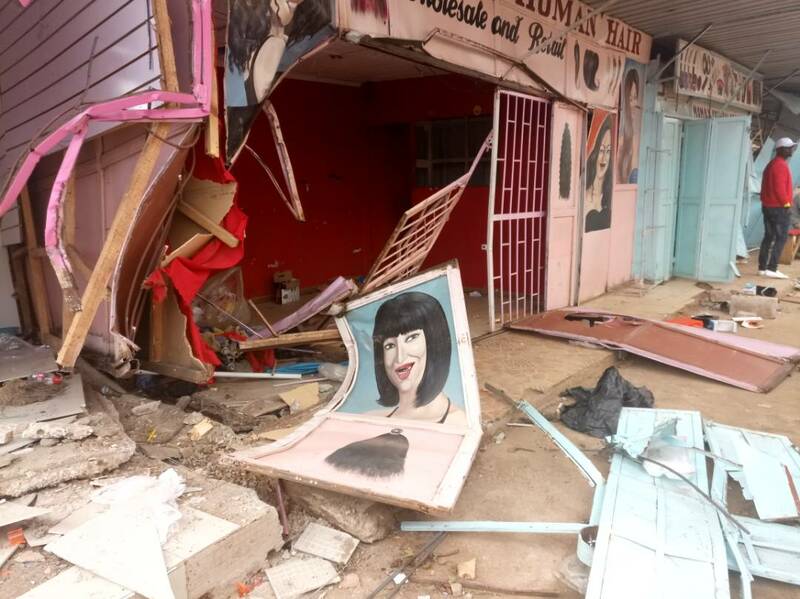 The Local Government minister should have surmoned the Mayor and not this man.
. . . .”Mwila says that while as a Party, the PF does not support illegality, it is extremely wrong and insensitive for the Council to destroy and loot people’s property”. In this instance, Mr Mwila thinks the Council is obligated to give notice to who deliberately break the rules. This is criminal. You can’t just destroy and loot people’s property without warning. The City Council will need to compensate these poor people, and the deputy mayor needs to get fired. And who is the mayor again? I hope it’s not that lazy sleepy guy that was in office during the recent deadly Cholera outbreak. Both of them need to be kicked out of office for incompetence. Shame on them. Thats not the point, these people should have been asked to pack their belongings when the day ended. What do you think would have happened, illegal building is just that …PF would have interfered like they did in Ndola where that State House Minister personally went there. @Kaluba are you sure that they were not warned. The Kaponyans never list to warnings. Right now Zambia Railways is warning people who have built on their land to remove what they can salvage but nothing is happening. Wait and until things have been destroyed – even the PF fimofimo will cry foul. Look at how people resisted to move from the streets – Army had to be called in. Even opposition parties had all sorts of theories. Talk about the phone in programme but now everyone is happy with a clean city. (Continued)… WARN first, before acting. Tulekwatako uluse: When these people were building where was the Mayor, Town Clerk, City Engineers who should have told them not to build at a wrong place. Could it be that this place is for some special people known by the Mayor. Be kind to your brothers and God will be kind to you. You should have settled amicably. Very sad indeed. This is criminality. prosecute whoever was involved. Pf secretary general is allowed to summon the mayor of Lusaka? Didn’t know he had that much power. Anyway I somewhat agree with him. Why not allow the illegal traders to pack up the property before destroying the stalls? Two wrongs…. These fooools take this same corruption of power abroad where the summon opposition leaders in those countries. @ banda… mayor is a PF member, nothing wrong in summoning this wrong doer. Sad that this was poorly handled. But there must be a clear distinction between a political party and Government. Why should a local government official be accountable to a political party secretary general? We don’t want a return to “The party and its government”. The person who should be summoning the Mayor is the minister of local government or the president. Mwila is NOT a government official. please. Why the president, why not those fellas who drive SUV’s all over town!! This is the same PF thug who was urging his caders to steal council plots and take over public spaces ……this Congolese thinks he is the government…..total lawlessness under the corrupt theif lungu. Mr Mwila is the Secretary General of the Patriotic Front and not the Permanent Secretary in the Ministry of Local Government and Housing. Is Mwila a civil servant or a political cadre? THATS THE WAY HON MWILA….NO WONDER YOU ARE A PEOPLES MAN …. OVERZEALOUS FOR NOTHING…..THE ISSUE SHOULD HAVE BEEN HANDLED IN PROPER AND AMICABLE MANNER……. I HEARD LUSAKA MINISTER ON QFM THIS MORNING CONFIRMING THAT HE WAS PRESENT WHEN THEY WERE DEMOLISHING STALLS.. LUSAKA MINISTER AND MAYOR SHOULD BE REMINDED THAT WE A PRO-POOR PARTY. HON MWILA SIR SUMMON HIM ALSO….. It buffles me as to think where the council was when people were building the stalls. I believe the affected traders had the approval of the council. THERE ARE SOME ILLEGAL HOUSES BEING BUILT BEHIND LIBALA SECONDARY SCHOOL. COME AND DESTROY THEM ALSO. PF is a challenge. The same council approved those structures. The people who were part of the demolition squad shud b charged with treason. Does the PF general secretary has the authority to summon the mayor? 1 No prior warning was given according to the article. 3. The SG has the right to complain and caution the Mayor because he was sent by the part to represent their policy so for those of you who the SG has no power you are wrong The part in power is the government so basically you cant separate the two. Mayor do your duties professionaly do not fear anyone. Clean the city of Lusaka. Come to SOS where someone has built a wall to frontage of the road. The PF SG knew all along what was about to transpire. All this summoning of the mayor etc etc is all part of the grand scheme of things and public relations gimmick just to make sure pipo don’t rise against the party.Nuthing will come out of this and it will die a natural death in a few days time. I also failed to understand why the SG summoned the mayor, even though he is a PF member… what if the mayor is from the opposition. if the mayor performed ultravirus, let those responsible act. The SG of one criminals party has no right to summon and question the MAYOR who is elected by the people, let the relevant ministry do that NOT a political party. How do u compensate when u dont have records what was inside before looting? Just follow the law and nothing of such nature will happen to your building. You cant have a dirty town at the expense of votes. Clean up the town. PF SG please leave the mayor alone to do his work. Do your job too by cleaning PF which is in a mess too. Party Secretary General vs The peoples elected mayor, who is above who? Violation of powers at its peak. Can someone explain the role of the Secretary General of the party and the role of the Mayor of the city.